The first half of the 13-th century. 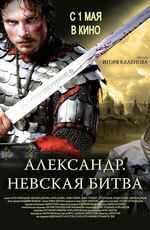 Novgorod duke Alexander is loved by his people? but he also has a lot of enemies. Batyi's huge army threatens to attack from the south. Swedish knights plan a crusade to Russia and they send their spy to Novgorod. The boyars' opposition prepares an attempt upon Alexander's life. It nurtures a traitorous plan to surrender the city. To cap all, the duke's best friend Ratmir fell in love with Alexander's beautiful wife, and now he can become a dangerous enemy for Alexander. The duke is young, but the life requires from him military valour, foresight of a diplomat, and deep worldly wisdom.